Today is Yom Hashoah, Holocaust Remembrance Day, a day to remember all those who were killed during the Holocaust. As a result of my genealogy work, I have learned in the last few years that there were many members of my extended family who were victims of the Nazis. I had always assumed that all my relatives had left Europe before Hitler came to power—long before he came to power. So learning about the many members of the Seligmann family who were killed and then more recently about the many members of the Schoenthal and Hamberg families who were killed has been very painful. The Holocaust touched us all, whether we know it or not, whether we are Jewish or not. Our world lost millions of people. As each generation learns how cruel and inhumane other people can be, there is once again a loss of innocence. I dread the day when my grandsons also have to learn this horrible truth. Last spring I visited the camps at Terezin and Auschwitz. I carried with me a list of the names of my relatives who had died at each of the camps so that I could honor their memories. That list has grown since last spring. One of the most recent names I’ve had to add to the list of those who died at Auschwitz was Liesel Mosbach Lion, granddaughter of Rosalie Schoenthal Heymann, my great-grandfather’s sister. Liesel was my father’s second cousin. I recently posted about Liesel and her family and what happened to them. 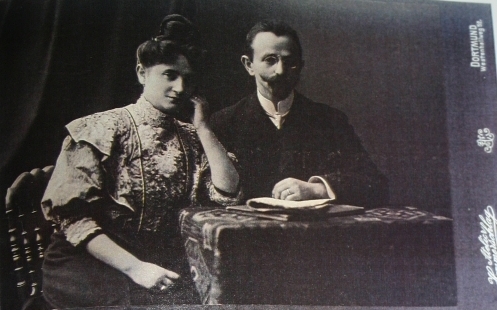 Most of what I knew came from the memoir written by Liesel’s husband Ernst Georg Lion, The Fountain at the Crossroads. I was so moved by his book that I have decided to see whether there is a way to get it published in a format where it will be accessible to more people. I am now in touch with Ernst’s son Tom. He sent me photographs of Ernst and his family, including my cousin Liesel. With his permission, I am posting a few of them here to honor their memory this Yom Hashoah. 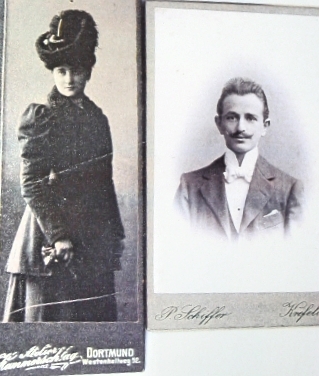 The first three are of Ernst’s parents, Leo and Bertha (Weinberg) Lion. Bertha died from the stress caused by the Nazi treatment of Jews during the 1930s. Leo was killed in one of the camps. 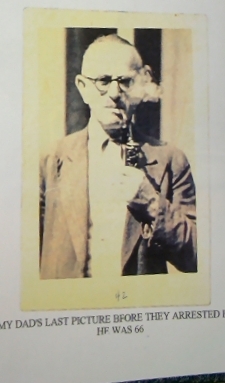 This is the last photograph taken of Leo Lion before he was arrested and sent to a concentration camp. On the left below is my cousin Liesel Mosbach Lion; she was killed at Auschwitz. 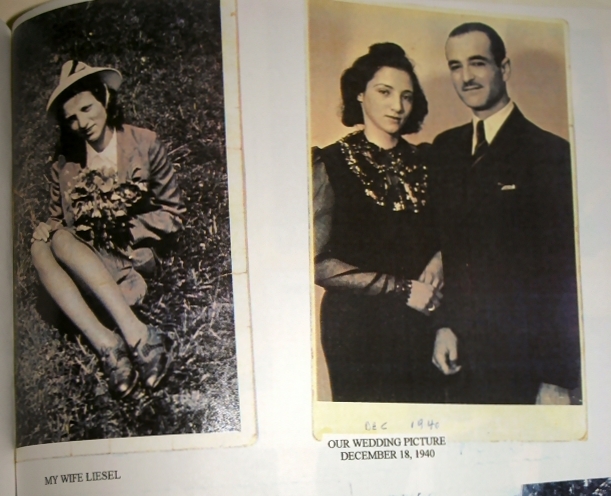 On the right is the wedding picture of Liesel and Ernst, December 18, 1939. Liesel, her sister Grete, both of her parents, Helene Heymann Mosbach and Julius Mosbach, and her aunt Hilda Heymann were all killed during the Holocaust. Her grandfather Willy Heymann was arrested and taken to Dachau and died soon after being released. They were all my cousins. 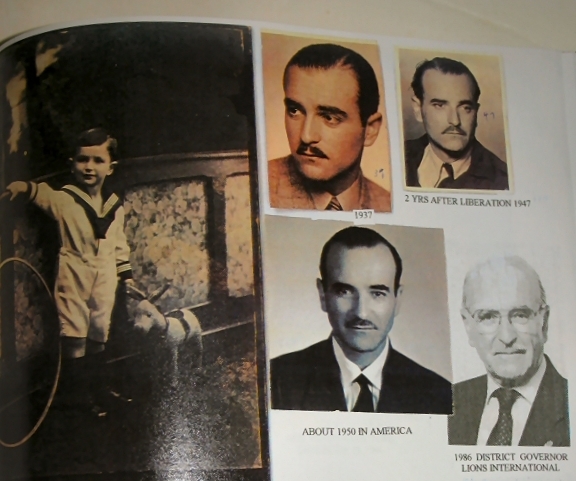 These are various photographs of Ernst from childhood through the war years and afterwards in the US. His story of suffering and survival is unforgettable. We live in a time when once again hatred and fear permeate our world and demagogues are seeking power. We must be vigilant and remember what happened then. We must do all we can to ensure that genocide does not occur again anywhere. We must never forget. Never again. This entry was posted in Germany, Holocaust, Reflections, Schoenthal and tagged Ernst Lion, holocaust, Nazism, schoenthal, Yom HaShoah by Amy. Bookmark the permalink. Thank you for this blog, Amy. I think you have more time. It’s a different world now with access to so much information, but I think I was at least eight or nine years old when I first learned about Anne Frank. That was my introduction to the Holocaust. Thanks, Amy. You have done amazing work with your blog and memorializing your relatives. I am going to share this post on social media. Thank you, Luanne. And thanks for sharing. I know you will reach many more people than I do. You are so right. We must never forget. I don’t know how people who did survive the tragic loss of family in this manner lived the rest of their lives. How does one cope? How does one not become bitter? This is another lovely tribute, Amy. I think people coped (or didn’t) in different ways. Ernst certainly admitted that he was terribly scarred by his experiences. From my limited exposure to survivors, whether in person or through reading about them, I’d say many repressed as much as they could and focused on the future. It must have been much too painful to live otherwise. This and the time of the Underground Railroad are the two periods in history that get me the most. It’s incredibly hard to fathom such careless disregard for human life. Keep on posting; we need to read it, again and again. I hate to agree, but I think chances are that you will also find that some relatives were in fact killed. Maybe not close or direct family, but cousins of your grandparents or their children. If I didn’t know it was true and came from another planet, I could never believe that people could ever do this to other people. But those who deny the Holocaust happened sadly have a different agenda. Amy I’m glad you are looking into a way to publish Ernst’s memoirs so more people can read his story, the story of so many. I am trying to work with Tom to figure out what’s the best approach—a traditional publisher? An e-book? I’ve no experience in this area, so I don’t know where to start. I’m sure you and Tom will find the best solution. Such a lovely post Amy. I never forget. I am not Jewish and as far as I know I don’t have any Jewish ancestors but I never forget. I read as many Holocaust memoirs as I can handle each year. I am in awe of the strength of some of the survivors I have come to know through their own accounts. Every time I read another account I am once again shocked by what we humans can do to each other and what we can watch happen to each other. Humanity is a tenuous thing and hate is our greatest threat. Thank you for telling the stories of your loved ones. They have been very meaningful to me. Thank you, Amberly, for your thoughtful comment. I really appreciate it. And we must also remember that Jews are not the only ones who have been the victims of genocide. We must prevent it from happening to any people anywhere. I agree! I have read about a few other genocides as well. The tragedies in Rwanda that I have read about are seared into my brain. I have to be careful though because I am pretty sensitive and I can only handle so much. But I think it’s really important to read survivor stories and understand how one corrupt leader or group of leaders can slowly change an entire society until they are suddenly on the brink of complete disaster and committing genocide. I can’t believe that is something that has EVER happened. I am the same way—I can’t sleep well after reading or watching something like that. And I don’t want to get into politics, but I think this year’s Presidential race shows how people can easily be swayed towards hate by a so-called charismatic leader. I totally agree. I can’t believe the current slate of candidates. I’m not super political so I know I’m not as well informed as many and a lot of my opinions about the candidates includes my gut feeling as I listen to them, but I don’t think our choices are good. All three of the current front runners scare me for different reasons! For the first time in my life I feel like I need to research ALL of the candidates that will be on the presidential ballot because I’m not okay with the current three main candidates. Crazy!! I have even read several books about German citizens and the struggles they went through during WWII – of course these were all citizens who didn’t agree with Hitler. I find their stories heartbreaking also. Their accounts of what it felt like to have someone come along who was going to help solve some of the national problems and then he slowly moved things in a crazy direction. It must have been such a scary time for all good people – Jew and German. I love to hear of some of the German heroes who struggled through those years seeking a balance between self-preservation and assisting Jews. It would be so hard to stay just in line enough to avoid suspicion and then do whatever you can to help. I’m sure I would have been carted off almost immediately because I am not as good at seeing the bigger picture. I can’t sacrifice the one for the many. I would be terrible in a war. Hopefully I never have to find out if I’m right. I don’t know that I could predict what I would have done. It’s easy in retrospect to see how things were turning and to think I would have done something to stop it (if I wasn’t Jewish). But I think most people just didn’t believe anything that awful would happen until it was happening. And that’s what I worry about with one of the candidates (not the other two)—that bigotry against Mexicans and Muslims and who knows what other ethnic groups will lead to violence and even extermination. It really scares me. With increasing intensity I researched the fate of Jewish families, many of them horrific. In the city I live today, a local family was able to hide a Jewish man (their in-law) from 1939 to 1945 in the same downtown building – air raids, scarce food, and many risks notwithstanding! This was a vile regime that will never be forgotten. Modern day Germany does not shy away from its history as any visitor will understand. No, I can’t comment adequately. Because I am not Jewish, I cannot hope to feel the immediacy of grief everyone who lost someone must be feeling at this time. I can say this should not be a private remembrance. Those first tiny sparks of racial hate are all around us, waiting for just one to set the flame. No, we must never let it happen again, but it is always near. We should be very, very vigilant. I agree, unfortunately. Thanks for your thoughts.